3. In a non-stick wok over high heat, heat the oil. Add the chopped onion and chile flakes and stir-fry for 1 minute. Add the green beans and stir fry for 2 minutes. Add the carrot and parsnip and cook for 2 minutes, then add the mushrooms and garlic and stir-fry for a couple more minutes. 4. Add the Swiss chard and cook another few minutes until wilted. Season with salt and pepper to taste and remove from the wok. 5. In the same wok, over medium-low heat, add your cooked noodles. Add the soy sauce, tamari, Chinese five spice powder and stir to mix well. Cook for 1-2 minutes. Add the vegetables and toss together and keep warm. Squeeze lime juice overtop and mix well. Season to taste. I couldn’t agree with you more on hiring movers – I did it several times without and looking back I wonder what I was thinking! Thank you for the shout out! I love 5 Spice. Yours is a great use – I love that you used parsnips in the mix! 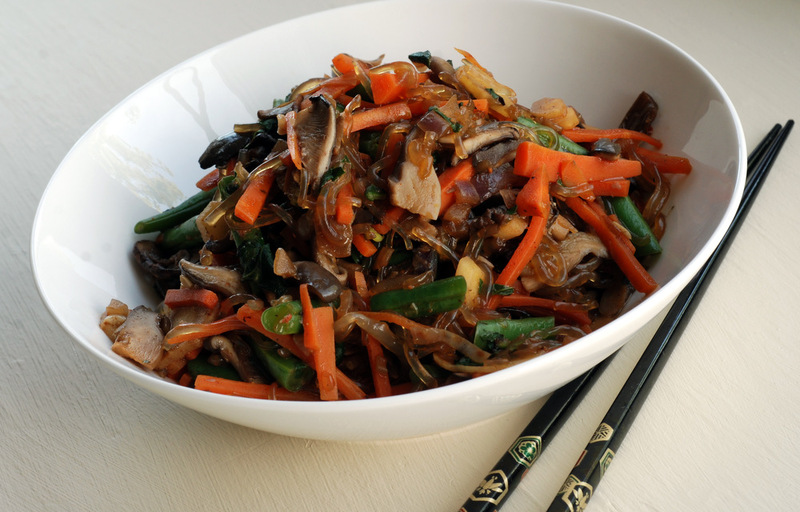 looks very much like the korean japchae to me, though that is made with sweet potato starch noodles! very yummy! I love having spice blends handy, store bought or home blended, it makes a quick meal into something that tastes like you spent 3 times as long making it! I never thought to use 5 spice in my stir fry dishes, though, only oyster sauce, hoisin, soy sauce, ginger and some other pastes and liquids! My mom uses 5 spice in her pork roast. I made it once when friends came over and it was just like mom’s, I was so happy! Yummy, that looks superb !!! This looks terrific! I may give it a try with rice noodles. I haven’t had much luck with kelp noodles. How do you keep them from being jaw-breakingly chewy? Rice noodles would be fantastic here, too. For kelp noodles, they mellow if you heat them. I also find that if I store them for a day in a container, after rinsing them well, I find they aren’t “crunchy” at all. Looks delish! Nice to get extra info from the comments–will also try rice noodles, as trying to stay off gluten. And I hope the unpacking goes smoothly! Unfortunately no kelp noodles though! I’ll have to pick some up to make this…if there’s one spice that always reels me in, it’s five-spice! that looks delish! I havent used 5 spice yet.. which needs to be corrected.. thats a lot of amazing recipes to try! Lucky you being able to use up all your root vegetables. As we are only just coming into winter here, I have a whole lot of root veggies ahead of me! Great recipe – I love the use of Chinese five-spice. I’m curious about the kelp noodles though – I’ve never come across them here, but would love to try them. Thanks for sharing this at Cookbook Sundays. 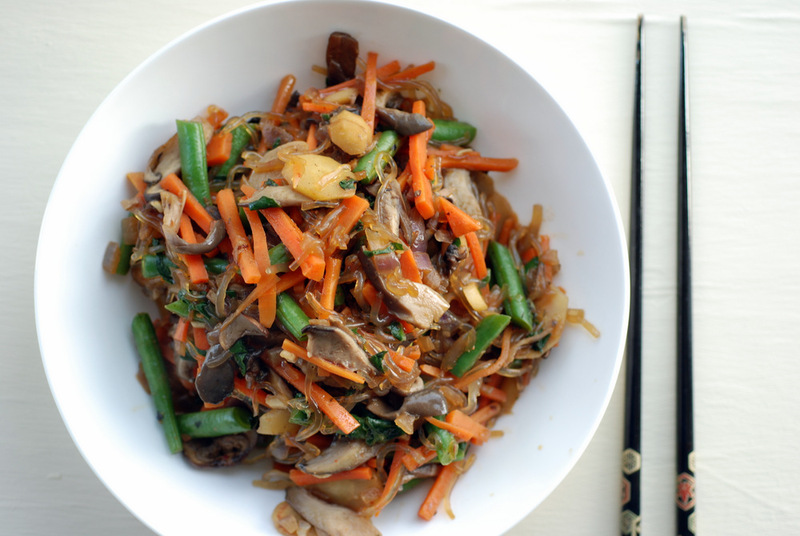 Wonderful recipe… it looks like the dan dan noodles I order at my favorite Chinese restaurant. 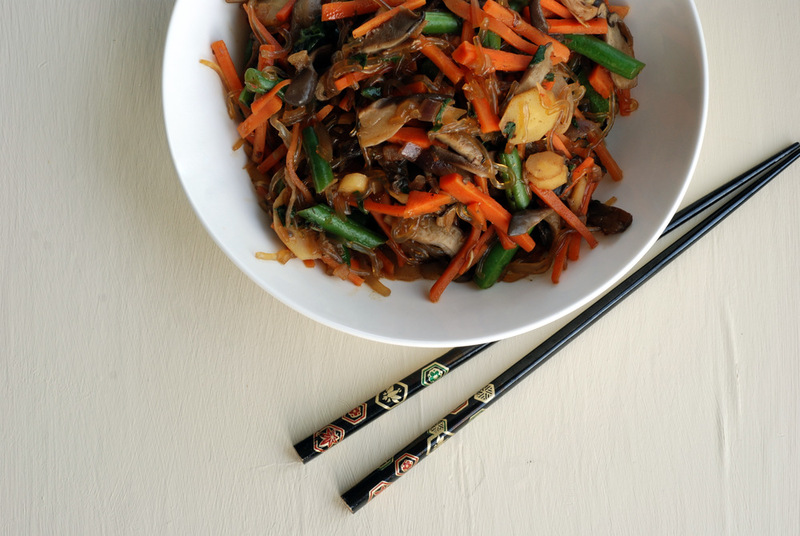 Excellent, simple stir fry recipe. I love five spice and always like to add it to my stir fries as an essential seasoning – to my mind, the simple combination of sesame oil, soy sauce and five spice (together with a base of chilli and garlic) is more than ample to make a wonderfully seasoned stir fry, and is infinitely better than the various store-bought stir fry sauces. Who wants a gloopy, saucy “stir fry” when you can have the real deal with five spice! Yummmmmmmmm……I am a big fan of Chinese 5 Spice and use it often in baking and main dishes.